Pleasant Islander. Other spellings have appeared, such as Naoero on the national crest. Identification. The name Pleasant Island was used by the first Europeans in reference to the lush vegetation and friendly inhabitants. Nauruans are attempting to recreate that image after the devastation left by phosphate mining. Location and Geography. Nauru is a single, almost circular island, 37 miles (60 kilometers) south of the equator. It is over 185 miles (300 hundred kilometers) from its nearest neighbor, Ocean Island, and nearly 500 miles (800 kilometers) from Kiribati to the east and the Marshall Islands to the northeast. The Solomon Islands are 744 miles (1,200 kilometers) to the southwest. Topographically, Nauru is shaped like a hat, with a coastal fringe forming the brim and the raised interior forming the crown. The interior, known as Topside, makes up four-fifths of the island; it has been mined for phosphate, and now is an almost impassable area of calcite pinnacles. Buada lagoon is in the raised interior. The island covers a total area of 13 square miles (21 square kilometers). The island is a raised reef consisting of calcite and phosphate on a volcanic base. Nauru has very steep sides that drop down to the ocean floor. This has made anchorage for shipping difficult and necessitated the use of a special mooring device. Demography. The population has been estimated to be over nine thousand, of which indigenous Nauruans account for about six thousand. In the 1992 census, the population was projected to reach 8,100 by 1996, with a growth rate of 4.3 percent. The remainder of the population includes Pacific islanders from Kiribati, Tuvalu, and Fiji, along with Chinese, Filipinos, Indians, Australians, and New Zealanders. The population is relatively young, with 66 percent of the people under age 24. Population growth has been a major concern throughout the twentieth century. Attempts to reach a total of 1,500 were set back by the influenza epidemic of 1919, but that figure was reached in 1932, a date that now is celebrated as a national holiday. However, the population was severely reduced by starvation, disease, and bombing during World War II. In 1943, of the 1,201 Nauruans deported to Truk by the Japanese, 464 died, leaving 737 to return on 31 January 1946. The population reached 1,500 again in 1950 and has continued to grow. The nation continues to espouse a positive population policy. A very small proportion of Nauruans live overseas, but many visit Australia, New Zealand, and other countries for purposes of work or education or to visit family, and return home. Linguistic Affiliation. Nauruan is classified as a Micronesian language but does not fit easily within subgroupings of Austronesian languages. It shares some words with Kiribati but is recognized as standing alone. Nauruans are writing their own dictionary. All Nauruans speak English as well as their own language. Symbolism. The frigate bird is a major symbol; it is found on the fin of Air Nauru planes and appears as the official logo. The crest consists of two palm trees encircling an orb that includes a Christian cross above a resting frigate bird and a flower. Above the orb is a twelve-pointed star representing the twelve tribes of Nauru. Beneath the orb are the words "God's Will First," indicating the Christian basis of the community's way of life. Phosphate has become another symbol, forming the basis of the nation's wealth. Emergence of the Nation. In 1968, Nauru took over the management of its people and affairs when independence was granted by the trusteeship committee of the United Nations. It took over the running of the phosphate mines in 1970 after paying $13.5 million (U.S.) to the British Phosphate Commission. Those two assertions of social and economic self-reliance released Nauruans from the dominance of outsiders who had exploited the phosphate and the people for seventy years. 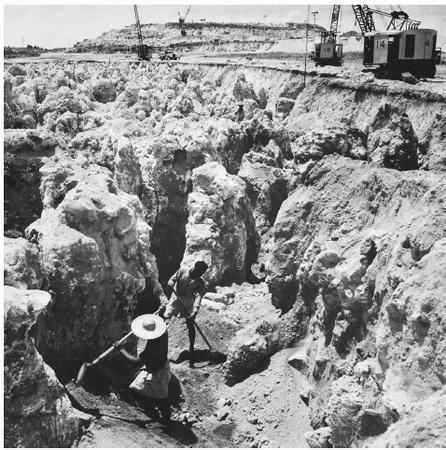 Mining for phosphate, which dominated Nauruan history in the twentieth century, began when the Pacific Phosphate Company based in Sydney found high-grade phosphate in 1906. This mineral was used to fertilize pasture in Australia and New Zealand. Control passed from Pacific Phosphate to the British Phosphate Commission (BPC) in 1919. BPC was owned by Australia, Great Britain, and New Zealand. In addition to running the mine, Australia became the administering authority under a League of Nations mandate after World War I. Thus, the lives of Nauruans became inextricably tied to Australia and BPC until they achieved independence in 1968. The mine was run using laborers from China and the Pacific islands, particularly Kiribati and Tuvalu. Nauruans chose not to work in the mine other than to hold administrative positions in the 1950s and 1960s. Today most of the administrators are Nauruan, and labor is brought in on contract from the Philippines and India as well as from Kiribati and Tuvalu. World War II left a major mark on the history of Nauru. In 1942, the Japanese invaded, bringing some seven thousand men and military installations and building three runways. 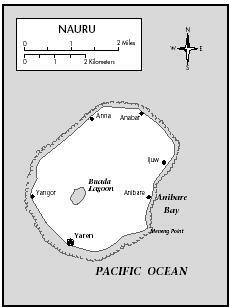 Two-thirds of the population was deported to Truk, an atoll to the north, where one-third died of starvation and disease. Those left on Nauru suffered severe privation, including starvation and bombing by the Americans for two years. When Australian forces reclaimed Nauru at the end of the war, the island was a mass of military litter, almost totally lacking in food supplies. In the 1800s, the island had been a playground for whalers and beachcombers who left behind many English-sounding surnames, as well as guns and gin that added to the damage caused by mining. Nauruans want to rehabilitate the island so that they can use the interior four-fifths that has been mined out. Rehabilitation will be funded by 1993 payments of $120 million by Australia and $12 million each by Great Britain and New Zealand as compensation for mining damage before 1968. National Identity. National identity as Nauruan remains very strong. It can be claimed only by those born of a Nauruan mother. All Nauruans are registered at birth, or shortly thereafter in the Births Deaths and Marriages register of the Nauru government, under their mother's clan. Failure to register a child as Nauruan eliminates that person from the entitlements of being Nauruan, particularly access to land rights, and to shares in phosphate revenue. A child of a Nauruan father, but whose mother is of another nationality must seek special permission to be registered as Naruan. Ethnic Relations. Ethnic relations between Naruans and other groups brought into the small island, such as Chinese, Filipinos, Kiribati, Tuvalu, and Fijians are marked by clear distinctions—the latter are grouped as Pacific Islanders. Each group is known for its particular place in the phosphate industry, and for the lifestyle adopted in Nauru. For example, the Kiribati men have brought their small canoes, from which they fish to sell to nauruans. All other groups work for Nauruans in one way or the other. Nauru lacks an urban space. Eighty-five percent of the population lives on the narrow coastal strip, with the rest living around the Buada lagoon. All nine thousand inhabitants are crowded alongside the phosphate-processing facilities and the port, mainly in the southwest corner of the island. The airport runway takes up much valuable flat land. Virtually no land is used for agriculture. Until Top-side is rehabilitated, the expanding population will become increasingly crowded on the coastal strip. Before mining commenced, the people of Nauru used the interior of the island as a means of crossing from one coast to the other and as a source of food and recreation. The government intends to return Nauru to its status as Pleasant Island with vegetation and places for recreation. Food in Daily Life. Almost all food is imported, with the exception of fish caught by Kiribati fishermen. Nauru provided pandanus and fish in premining times, and these were eaten with coconut meat. In times of drought, food shortages could last for two or more years. As a result of mining revenues, the people have a variety of supermarket foods, from turkey to milk. Rice is the basic staple, and fish with rice is the ideal meal. This diet is said to contribute to a high rate of obesity, which often is a precursor to diabetes. Basic Economy. Phosphate revenues are the mainstay of the economy, together with investments made with revenues earned from earlier mining activities. An average per capita income of $14,400 (U.S.) per year covers up the two extremes: those who have a large number of investments offshore and those who have barely enough to live on. Nauru is an expensive place to live, as almost all necessities have to be imported, although water is now obtained from a desalinization plant. Until the mid-1980s, Nauruans had a strong welfare economy in which housing, education, and health were provided and government scholarships were available for tertiary education overseas. Major cutbacks in social welfare provisions have forced people to buy the materials for their houses and rely more on their personal incomes. Nauru Trust Funds are another potential source of income for all citizens who are recognized landowners and members of Nauruan matrilineage. Five funds were set up between 1920 and 1968, but payments have not been forthcoming as the trustees and the government struggle to assess the amount of revenue in the funds. The Nauruan people will have to live off the proceeds of mining, which is almost finished. The government is looking for economic alternatives. Classes and Castes. Nauruans pride themselves on being a democratic society and denounce the two classes that formerly marked their society. The temonibe and amenengame classes consisted of the senior matrilineage as opposed to those in the junior matrilineages. These two classes were distinguished from the itsio, or slave class, which included those who arrived on Nauru from outside and had no land holdings. Heads of lineages were drawn from the temonibe class. A chiefly system instituted in 1927 was replaced in 1951 by the Nauru Local Government Council which consists of elected members. Symbols of Social Stratification. Symbols of stratification are more latent than overt. Elites with large off-shore bank accounts are known by reputation, as it is not acceptable to flaunt wealth on the island. Trucks or motorbikes and large houses are the extent of manifestations of wealth. 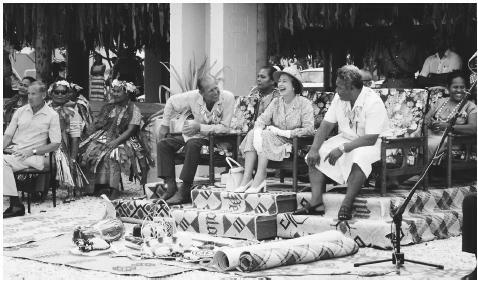 Queen Elizabeth II and Prince Philip visit Nauru. Great Britain helps fund rehabilitation for mining-damaged land. and five cabinet ministers as well as a judiciary and a public service. Nauru maintains diplomatic relations with several countries. There is no military force. Social Problems and Control. Drunk driving, particularly by young Nauruan men is a serious problem and the leading cause of death on the island. Families exercise social controls, though there is a police force for major social violations. Concerns about pay-outs from the Trust Funds led to a sit-in across the airport runway in 1993 at the time the Pacific Forum leaders were arriving. That reaction resulted in those women (it was a women's action) being fined, some lost their jobs, and the leaders were arrested. There is no jail as such on the island. Serious criminal offenders may be incarcerated in an Australian jail by arrangement. Nauruans grew up under a broad welfare system in which all their welfare needs were met. Those funds came from the Australian administering authority out of a special Nauru Trust Fund whose money came from phosphate profits. Housing, education, health care, and the public service were all paid for under this administrative account. That system was terminated in 1986, and older Nauruans are finding it hard to live under the new regime, especially those whose lands were mined early. Nauruans have been asking the government for money from the trust funds, and this has caused political antagonism. Division of Labor by Gender. A division of labor by gender is not easily defined. The matrilineal social system gives women a lot of power, so they lead behind the scenes, while men take the political roles in government. Civil Service consists of mostly male heads with women seeking these jobs in the past 20 years. Two of the diplomats in overseas postings have been women. Most of the primary school teachers are women, while men are active in phosphate management. The term "division of labor" is no longer appropriate. Nauruans maintain social ties through the mother (matrilineal ties). Mothers are the anchor persons of kin groups and residential groups, and ties between sisters and brothers are strong. Women are the main care givers within and between households, but they have entered the workforce in considerable numbers in the last fifteen years. Men predominate in political affairs and all senior government positions. Only two women have shared political office at any one time. Male leadership has dominated Nauru's external affairs. Women are active in the National Council of Women and in church committees. Islanders with a tame frigate bird for catching fish. Almost all food is imported, with the exception of fish. from another clan. Marriage today is largely a Christian affair, though there are concerns that some young people are opting not to marry; their children belong to the mother's lineage. Households center on the mother, who takes care of and then is cared for by her children. The nominal head of the household is the male, but the decision-making head is the mother, who is largely responsible for economic management as well as social care. Land and other properties are inherited by both sons and daughters, but only daughters can pass on their rights to their children without seeking extended family consent. Modern properties such as motor-bikes are passed on within extended families. All Nauruans belong to a district. That affiliation is inherited through the mother or father but may be changed during a person's lifetime for political reasons. District affiliation includes responsibility for participating in district activities. Children belong to the mother's lineage but are cared for equally by their paternal kin. Adoptions, whether formal or informal, are fairly common. Children are indulged by Western standards; they can and do exercise a traditional right of demand for goods from the mother's brother. They are seldom left alone and form part of a large network of kin that extends around the island. A primary school is located in each village; from there students progress to government high school or the Catholic high school. A few are sent to Australia or New Zealand to study, especially if their parents received their secondary education overseas. Government scholarships for Nauruans are offered for tertiary study in Australia and New Zealand. The University of the South Pacific Extension Centre is offering opportunities for tertiary study. Religious Beliefs. Christianity arrived in the 1880s, introduced by both a Catholic missionary and a Congregational minister. Those two religions dominate today. The Catholic Church provides a secondary school, while the Congregational Church, which is the national church, has a major church in the center of the downtown area and smaller churches in the districts. Timothy Detudamo translated the Bible into Nauruan in the 1930s. Before Christian beliefs arrived and mining destroyed Topside, Nauruans believed in the primordial establishment of the island by two spirits that came from Kiribati and were manifest in two rocks, one on either side of Topside. Those rocks have disappeared, along with many of the other useful aspects of Topside. Buada lagoon is another site of spiritual strength for some Nauruans. Government concerns about health have led to programs of intervention, including encouraging more sports and physical activity by young people. Attempts are being made to reduce the high rate of road accidents, particularly among male motor-cyclists. High alcohol use also is being addressed by educational programs. Two hospital exist on the island. One is run by the government for Naurans and a separate facility is run by the Nauru Phosphate Corporation for its contract workers. Nauruans have revived their interest in their history. The Department of Education is producing a history from a Nauruan perspective as well as a Nauruan dictionary. Writers are being encouraged, mainly through the USP Extension Centre on Nauru, to produce stories, poems, and songs. Throughout the twentieth century, poems were written to commemorate special events. 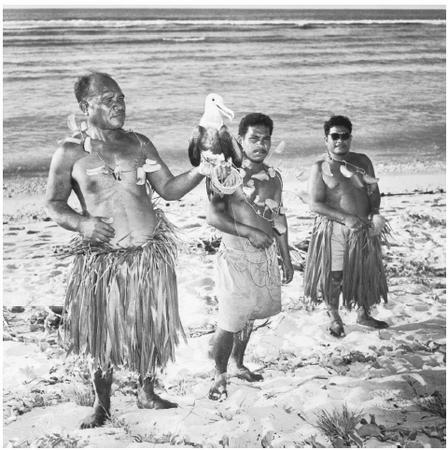 Those poems recorded not just historical events but also the culture of Nauru. The project to rehabilitate the interior (Topside) has generated considerable interest in the plants and animals of the island. The Committee for Rehabilitation of Nauru consisted of Australians supported by AIDAB and Nauru, working alongside Nauruans. It encouraged a number of young people to share their interest in and knowledge about plants as well as understanding of the social dynamics of the island. Dobson Rhone, R. "Nauru: The Richest Island in the South Seas." National Geographic 11(6):559–589, 1921. Ellis, Albert F. Ocean Island and Nauru, 1935. Fabricius, Wilhelm. Nauru 1888–1900, 1992. Hambruch, Paul. Nauru. Ergebnisse der Sudsee Expedition, 1908–1910, 1915. Kretzschmar, K. E. Nauru, 1913. Pollock, Nancy J. Nauru Report, 1987. ——. "Social Fattening Patterns in the Pacific: A Nauru Case Study." In N. J. Pollock and I. de Garine, eds., Social Aspects of Obesity, 1995. ——. Social Impact of Mining on Nauruans, in press. Viviani, Nancy. Nauru, Phosphate and Political Progress , 1970. Weeramantry, C. Nauru: Environmental Damage under International Trusteeship, 1992. I was trying to trace my family tree and my last name, and I was directed to Buada Lagoon. Is there any way I can trace my ancestors as Naruan? Hello. I am Chinese and currently residing in the San Francisco Bay Area. I spent 6 years of my childhood on Nauru Island in the mid- and late 70s, where my father was working at the time. I attended the Nauru Primary School (all I can remember is it is next to a cemetery). I would like to connect with anyone (of any nationality/ethnicity) who was there around that time. Thank you. Hi my name is Clorinda and i am eighteen year old, I am still in school also i am senior. My school name is Hawaii School for the Deaf and the Blind. Um i need know about kirbati island and how they set up marriage? can you tell me about that? so i need information for my class history so can you? Hello, Me ans my friend james have been learning about nauru.Where Australian and we have found how much we have comman. We just cant find what do you do for your daily life. Interesting article. I lived on Nauru in the 70's, went to Aiwo primary and then onto NSS. Lived in Meneng. I am from NZ. My family werent one of them that got greedy and destroyed your lovely island. Nauru back then was fantastic! Good times as a teenager growing up I can tell you. Free outdoor movies, 10cent bus trips, and sat matinees at the civic. Loved going to china town, and the infamous Star Twinkles restaurant. Ahh yes, good times, thank you Nauru. That is how I want to remember it. Cant believe its the same place! I often wonder if my old home is still standing. We lived right next door to government house. Well the back door of it lol. Loved to hear from anyone who shares the same interest. I am a Vietnamese guy. I'm very interesting of studying about different people and culture of small ethnic group in the remote area in pacific osean like Nauru etc.. I wish to visit Nauru and other islands in Pacific osean. I wish I can spend some time in Nauru sociaty for fews years. Thanks you helped me on my school report! Thanks again! This article really help me with my school report... thanks to who wrote this:) by the way Im from Yap..
i want correct ... "pure nauruan". i'm sorry to say that all the nauruans now are mix. the last pure nauruan was an old man who live ijuw. sadly he married to a kiritati woman ... meaning that "pure nauruan" ended. this was 50 years ago or more. we are still nauruan but everything changed. our looks and colour of skin and even our language slowly changing too. This site was heaps of help for me. I am 12 years old, Year 6, in Holy Family Catholic School, and Nauru is my topic for Inquiry, part of the ELLI program. This website had more than enough information for me, so I am sure to get a really good grade for my project. To be honest, I never knew Nauru existed before my project, and now, I know just about everything there is to know! How did Nauru get fresh water before the desalination plant? hello! im looking for some research on nauru culture and i would like to know who first saw nauru island and how did he finds it? im only 15 years of age now and i really want to know about my own culture ! and i think im the only one who's looking forward to know all about it! My family lived on Nauru (1977-1981). We live at N.P.C Residential N° 78 just above the golf course. My father Roger Frankling was a "Stevedore Supervisor" / "Scuba Diver" employed by Nauru Phosphate corporation and worked at the Nauru Boat harbour. I went to school at Kayser / Aiwo primary schools and was in the same class as Marcus Stephens (Future President of Nauru). My Mother Lin Frankling was a kindergarten teacher at Location. As a "small boy" i had very good memories living on Nauru. If you google search FLICKR: MARK FRANKLING you will see a "great" selection of Historical & Personal photos in Black & White / Colour. (Nauru Album) I hope that you enjoy!! I'm from Nauru or Kiribati.. That the common name that we use it in our country..(kiribati).. But i think that Nauru is a different country..BUt i know that it is part of Kiribati.. I was born on Nauru, mother is Nauruan, sister to Deigoub, Doidage,(both now deceased) Jacob and Demauw Bill. My father was Australian. I married an Australian. I haven't been back to Nauru since 1989, when my son was two years old, so it has changed somewhat. My mother (Eipum) and sister (Eilani) now live in Australia. Loved the memories of the Bula Bar owned by my Uncle Deigoub and Aunty Ta, and going around the island in the landrover, plus flying with Air Nauru back in the good old days. My sister still flies with the airline, now known as Our Airline. Love the information in the article. My parents moved to Nauru in 1965 Where my father Captain George Fishwick become the Harbour Master. I spent the first ten years of my life there and they were the happiest years of my life ,exploring the reefs ,fishing, war relics ,hole in the wall,China town , the outdoor cinema, diving off the harbour wall, getting coconuts, mangos and pandana's off the trees. I was on Nauru in 1973 and knew your father well. Ray #23 you ask how Nauru got water before the desalination plant was built. It used to be brought to Nauru in the hull of phosphate ships. The water was pumped out before being loaded with phosphate for the return journey to Australia. A sample of the water was always tested by the pharmacist at the NPC Hospital to ensure it was safe to drink. (sometimes it was found unsafe and was rejected). I have an album of 70 odd photos in Flickr. If you did a Flickr search on (say) "Nauru 1973" you should be able to find the album. Very informative article on Nauru. How do I reference this since the author has not provided full information on his or herself? Good day, i am a Filipino, my ancestors were Portuguese but i never been have any chance to go out abroad i love to care something work that is related in admissions both in local and religion activities. Last day i got to know an old man came here just to avail a hotel room preferably they were a medical city hospital patients i heard the old man was a diabetic, we shared once thoughts and views i love to go in Nauru. now i make bags, i design bags and i sell the bags at its cost so i am rightfully earning now a good life, a good chance. i am also a Christian belongs to a baptist group here in my country. Hello every one,my interest in Nauru is her population and land mass.Being from a very populous country(Nigeria) I was amazed to find that there is a country like Nauru.Am sure there will have less problems and have a closely knit society.I am happy to know you all and I wish us all GOD's continous Love and blessings.May the blessings be. There are some notes that need to be rectified. Nauruan is NOT the indigenous name used on official documents. Naoero or Anaoero is the indigenous name of Nauru. Naoero is the name on the Coat of Arms of Nauru and is used on all official documents. A child born of Nauruan parents whether it be their mother or father may obtain Nauruan citizenship. It is not only if your mother is a Nauruan. Another means of obtaining citizenship is by marriage. A woman married to a Nauruan man may apply immediately in the case of a man married to a Nauruan woman would have to apply after 10 years of marriage. The article references that only I-Kiribati fisherman provide a source of fresh fish. It is not only the I-Kiribati fisherman who do so but also local Nauruan fisherman who provide fish to the community. Driving under the influence of intoxicating liquor has been identified by the article as the leading cause of death. Although a prevalent issue, this is not particularly accurate as medical issues associated with high rates of diabetes, cancer and other forms of illness have resulted in far more deaths. Nauru does have a Corrections Facility and a Juvenile Centre for individuals incarcerated. In terms of land rights, both fathers and mothers may pass their land rights to their children. In terms of illegitimacy, under the law children may inherit from their mothers. The law does not make the same provision for fathers. The non existence of the law does not mean that children are not entitled to their fathers land rights. I am pleased to find this site and to read both article and comments with great interest. Especially the comments from Nauruans that revise the article. I so need to talk to a Nauruan who is able to give me a valid perspective on a creation myth that my brief research tells me is from Nauru. It is about Ancient Spider creating the world from a clam shell. I am in New Zealand, and am coming to the end of a 5 week storytelling course. I would like to perform this myth as a graduation piece next week. I have been asking people on the street, do you know anyone from Nauru? They say... where is that? Is someone willing to help me? My need is URGENT! Help me if you can! I read your article posted on 13 April 2009 with great interest because I was in Nauru during the period you mentioned. The name of the school that you are interested was called “Location School”. It provided primary education to children from Kiribati, Tuvalu, Hong Kong and Taiwan on Nauru at that time. The school got a Chinese section running a 6-year primary education program in Cantonese. Hope this would refresh your memories. I am from Kiribati.I was in Nauru when I was very young.My father was working at NPC at that time.It was in the 1970's.I spent most of my life on the island.I have some relatives that are part Nauru and Kiribati.I have so many good memories I can't forget in my life.I enjoy and loved the life on Nauru.I'm back with my family to Kiribati but I still hoped that someday I'll be back to the island again and see new things I've missed already.I'm glad I found this site and I loved it.Thanks. thanks for this incredible article on the culture of Nauru I plan to use this information for my Model United Nations class in school. I Will report back when I have gotten my grade for the assignment. Thank you for the many comments. I particularly welcome those who give us more information either as Nauruans or as residents who recall their time on Nauru. There is so little known about this very important island. Any new information is very precious. I hope to expand on the information here in a book shortly. Hi everybody, I'm a 16 year old girl working on a Creative Writing story. The assignment was to find a country that isn't very well known and write from the perspective of a teenager that lives in the country. I picked Nauru because it looked very interesting and the more I read the more interested I was. I was wondering if anyone knows common Nauruan names that would make the story seem like it was from a Nauruan citizens point of view. Anything would help and I'm really excited to see what becomes of the story! Thank you! This is fascinating, I stumbled upon this on a Google Map and I went to look up the Island and found this helpful site. I am from Florida in the United States of America. My husband is Turkish from Istanbul. We found this site very interesting. I am from NZ. My family lived in Nauru from around 1977 to 1979 when I was around 7 to 8 years old. I was looking at the site after googling Nauru Island Star Twinkles (memorises of my 8th birthday there!). Thanks so much to the author of this article about Nauru. l have really added up to my deposit of geographical and historical knowledge. Kudos. I REALLY LOVE MY WONDERFUL COUNTRY NEPAL. The first time I heard about Nauru, was when our DC-area radio staion was interviewing an athlete from this island country at the Rio 2016 Olympics. I had heard about this country before. I was curious, so I checked the Internet and found this site. Very interesting. Love to see the island someday. Oh, and similar Audro Bulut #42, I am Turkish and from Istanbul and my husband Is American and we are living in Northern Virginia. Again thank you for an interesting article. I would love to communicate with some native people from the island. I just happened upon this website. I'm sorry to hear how the mining has ruined such a beautiful country. I'm a 16 year old nauruan boy who live in Australia for 12 years and went to school at Palm Beach Currumbin High School. After twelve years of schooling i decided to go back to Nauru to see my family I don't really have thoughts about going back to australia because my life here right now is awesome. I'm a 14 year old Yapese girl and I admire the culture of other places, and Nauru is one of my favorite places. Who knows, maybe someday I'll come to Nauru and learn their culture. Now that I'm looking forward to! Hi Orata! My name is Olga, I am assistant at "Futur3" Theatre which is based in Cologne, Germany. Our new project is about Nauru Island. And we would like to hear people of Nauru in our new piece and let them express their own opinion about life on island. It sounds so nice what you've written here. Would you mind to talk with the director and crew and tell us more about your home? With best wishes, Olga. I will definately be follwing up on some of the photo links mentioned by others here ☺ Tubwa ouwak!! Hi There, I'm from Brazil. I wanna move to Nauru, me and my wife. I'll try to open a soccer school for kids. How can I proceed? And the life cost in the country. I have learnt a lot from this documentary. Most importantly, the Polygynist marriage. This article was super helpful for general knowledge and I think it is real neat how the forums are filled with such genuine fascination and honor to be able to learn about this beautiful country. Thank you. I am a mexican-american boy, its always fun to learn about differences and ultimate connection of all of us. Its crazy how universal catholicism is! Thanks again! Peace to you!